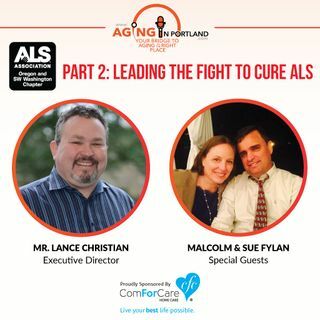 Special Guests Malcolm and Sue Fylan, along with Lance Christian, Executive Director of ALS joined us this week on Aging in Portland. Malcolm shares his personal story about﻿ first learning of his ALS diagnosis. Faced with this heart-wrenching challenge, Malcolm opened up to his amazing wife, Sue, and their children. Together, they immersed him in their love and on-going support. Lance also talks about emerging cures for ALS.